Went back to the idea of joining two halves. When I first did this, the seam was always clunky because at the time I had not figured out how to tie off a clean closing. I have since discovered the closing braid, and combined with a matching-color seam stitch the effect is striking. It looks like they are held together magnetically, or glued. 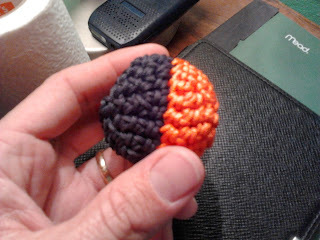 The colors really pop but better than that... two cleanly joined halves maintain an excellent spherical shape. The last stitched rows are joined face to face flattening out the curve and smoothing the seam. I smell mass-production. And by mass production I mean, for once in my life not trying something new every other projectile.